Richard watches in horror as the plastic fires below threaten to engulf him and his hovering friend Robo. A sudden explosion sends shards of plastic careening toward the two companions prompting Richard to plead for his friend to do something. Robo reacts, and before the two of them are consumed by fire, a large oval-shaped forcefield surrounds Richard and Robo. Within moments all light is blotted out as the molten plastic solidifies around the forcefield and creates a protective shell. Richard waits for the exploding sounds to die outside the shell while Robo guides the forcefield to a safe landing spot. When Richard feels the coast is clear, he takes his blade and hacks a hole at the shell, quickly creating an exit for the duo. Outside, the red beauty of the plastic desert has become a desolate wasteland of charred remains. A few moments later, Richard sees the cyber cruiser land beside them, which Robo montonously attributes to remote control. Soon the Chosen One and Robo are flying away from Mortex's desert on the cruiser. After a while, Richard sees some strange objects in the sky heading straight for the cruiser: a collection of flying cubes. Robo identifies them as cuboids and claims that they're harmless, but Richard quickly disagrees and points out that colliding with one could damage the cruiser. Robo agrees and adjusts his diagnosis. Suddenly, one of the cuboids knocks Robo off the cruiser and sends the robot flying into the flock of squares. Realizing he couldn't help Robo and knowing he could be struck next, Richard quickly makes the decision to land the cruiser. He dives out of the cuboids cloud and lands on the ground below. When he lands, he is amazed to find that the landscape resembles that of neon-like vector graphics. As he scans the surrounding land, he notices something in the distance heading toward him. As the object gets closer, Richard discovers that the thing looks exactly like him, with armor, helmet, weapon, and all. The figure moves and stands directly in front of Richard in silence. Richard draws his sword as a precaution, but the mysterious figure does the same. Richard demands the figure identify himself, and the figure calls himself "Richard, the Chosen One" in a voice identical to Richard's. When Richard asks if this is a joke, the imposter laughs. Angry, Richard lunges for his double, but the fake reacts by exploding in a flash of blue light and beginning to shimmer. 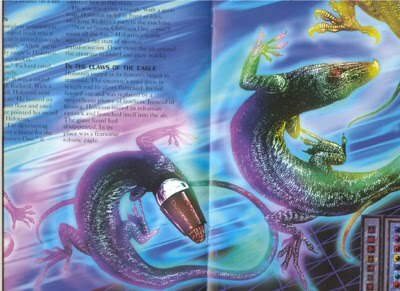 The air fills with electricity as Richard hesitates and watches as his duplicate transforms from a human into the form of a giant robotic lizard. The lizard hisses and reintroduces himself, this time as Holotron. The lizard threatens Richard, but the Chosen One indicates he is not afraid. Holotron laughs cruelly and uses his massive tail to swat at Richard and send him flying. 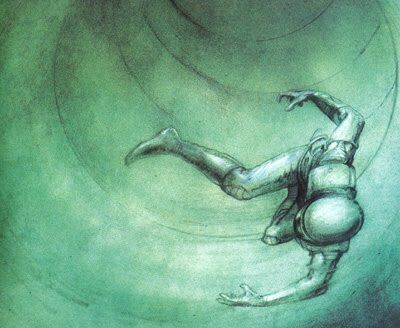 Upon landing, Richard quickly realizes he has no means of defeating Holotron and tries making a dash for the cruiser, willing to take his chances in the sky. It becomes very clear that Holotron, despite his size, is taunting Richard. The shapeshifter easily keeps pace with the cybercruiser and flies nimbly around the fleeing Richard. The Chosen One desperately wishes Robo and his binary panel were nearby, but the robot is nowhere to be seen. 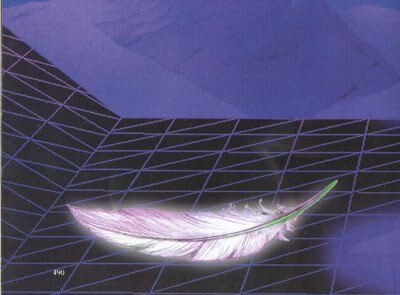 But then Richard notices something about Holotron's current form: though the eagle's body is fully tansformed the wings appear unfinished and looking like the neon grid landscape. Richard wonders if Holotron might actually be an illusion. He pulls the cruiser to a near halt and faces the eagle, who taunts Richard. 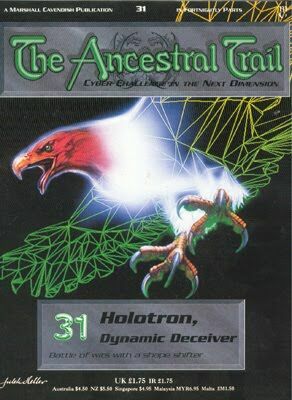 Richard responds that he believes Holotron is not real, which sends the eagle into a surprised and terrified roar. Richard stands his ground, which prompts the massive eagle to fly down and pick up a giant neon boulder. Holotron hurls the boulder at Richard, who stands his ground despite feeling his knees shake. The boulder passes through Richard harmlessly, which confirms his idea. Holotron suddenly begins to shrink in size and its fully formed eagle body shrivel into dust. The amazingly starts pleading with Richard to let him live as tears stream down his eyes. Richard, feeling a twinge of sympathy, asks how he can do so. Holotron pleads for Richard to believe in him, but it's too late: Holotron abruptly vanishes. Below, the neon grid landscape also changes, revealing a beautiful purple world. As Richard admires the newly seen world, he hears a familiar metallic voice behind him. Robo had been beside Richard on the cruiser all the time, but Holotron had hidden him from Richard's view. Eager to be on their way, Richard pushes the cybercruiser forward. After a long while, as the skies begin to darken, the cruiser starts to approach a ribbon of tall mountains. Robo says the mountains reach into the cyber stratosphere, making going over them impossible. They would have to find a way through them. The companions make their way through and beside several jagged peaks and hillocks until Richard spots something. It appears to be a door of some kind, but nothing like any door Richard has ever seen. The door's edge is lined with rows of teeth-like spikes, and around the floor of the door are remains of countless robots. Richard wisely suggests they find another entrance through the mountains, a suggestion with which Robo agrees. Richard comments that he doesn't wish to see what's inside that door, but Robo suddenly says that it's imperative that they do find a way inside, claiming that an Omni piece located there. Reluctantly, Richard lands the cruiser near the healp of destroyed rbbots and disembarks, wondering of there is another way inside. Robo begins to emit several pulses that Richard recognizes as radar, and eventually, the robot finds something. Robo directs Richard to a large circular panel in the ground, a secret entrance. 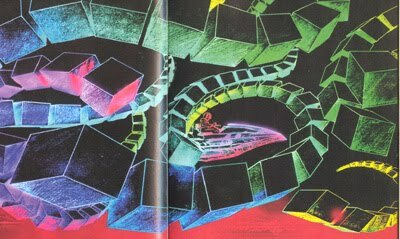 Robo uses his lasers to cut the panel off, showing a deep and dark tunnel. Robo commands the Chosen One to enter it, which Richard does. The two find themselves sliding down the cold and clammy chute. Their journey abruptly ends upon landing in a pool of icy cold liquid. Disgusted, Richard waits for his eyes to adjust to the light before he sees that they've landed in some kind of robot scrapyard. Both he and Robo were almost completely immersed in the chilling liquid. Suddenly, Richard hears the sound of something approaching and instructs his companion to keep quiet. Moments later, a small robot appears. Its appearance is fairly unremarkable except for one detail: for arms, the robot has a paiar of diamond-tipped chainsaws, obviously used to cut up robot components. The robot makes its way toward Robo. 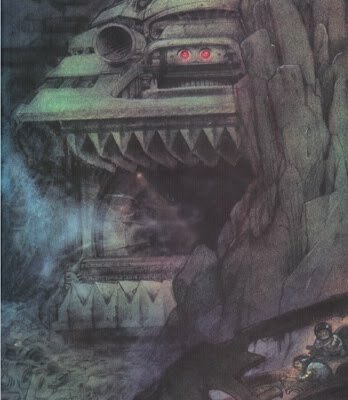 For the thirty-first volume of The Ancestral Trail, Richard and his companion Robo begin the main fetch quest of the second half of the series, which is collecting the currently mysterious Omni pieces. The first half of the series had the Life Force Pods and the guardians as the MacGuffins, and now it's the Omni pieces that Richard must find in order to return home. Will these strange pieces perform some kind of helpful side-effect, similar to how the pods bestowed Richard with improved stamina and courage, or will there be something darker in store for our hero? If it wasn't clear before, it should be clear by now that the Cyber World is very different than the Ancestral World, in more ways than one. While the Ancestral World could be considered one enormous world (the series included a giant map to prove as much), the Cyber World is far more disjointed. A lot of the areas that Richard arrives in don't appear connected to any of the previous ones, which can likely be attributed to his method of travel primarily being the cybercruiser. In a way, this disconnected world makes it far more deadly than the Ancestral World, as a rapidly changing landscape will always keep Richard forever guessing as to the next threat.